So you want to look more shredded? 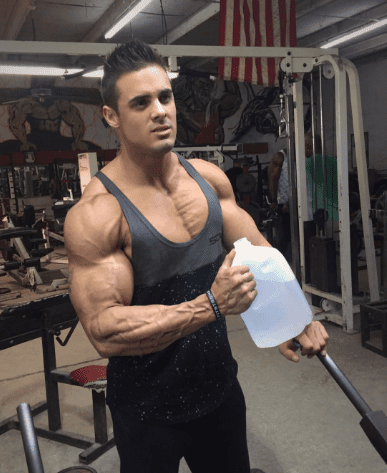 Water if used correctly can be a great tool to look more shredded. My name is Charlie and work here at BroScience. I’ve been using this tactic for years. Better muscle pumps and a more lean looking body. So let’s how you can also use this trick to look more shredded and get crazy muscle pumps. The first step is to increase water intake. You are probably asking : “Why would I need to do that”? Because when your body gets a lot of water for a few days it starts flushing it out automatically. Which means your body will be in overdrive trying to get rid of all that water you are consuming. You will be holding less water and look more shredded. This trick will not make a huge difference if you are fat. Only those relatively lean will benefit doing this. Even though fat guys might be a little less bloated when doing this, they will of course not get six pack abs just by doing this. You are not dropping any body fat in this process you are simply eliminating water retention so you will hold less water in your body. So if you are going to the beach for a day and want to look more shredded this might be something to consider. Remember you have to keep the water intake high for a few days so this actually works. You can then stop drinking water (or drink way less) then your body will still be in overdrive in flushing the water out of your body. Which means you will holding way less water and look more ripped ! It’s no secret that water plays a key role in muscle pumps. If your body is dehydrated and you go to a arm workout. You will probably not get that stupid pump in your arms. Have you ever feasted on a lot of sugary foods and gone to the gym the next day? If you have you have probably experienced this crazy pump. As your body is full of carbohydrates and water you will get a huge pump while training. This has at least been the experience for me. You can experiment with this and see how your body repsonds. I am not recommending sugary foods and junk foods but I get crazy pumps if I eat them and train the next day. Carbs hold water in the body, so you will probably also look a bit bloated. I Have Excess Body Fat How Can I Get Rid Of It? I’ve been there, most guys will at some point in their life get fat and out of shape. It’s nothing you can’t change, so don’t worry. First thing to focus in is your diet. Your metabolism is probably slow because of the bad foods you have been eating. Make it your mission to get a higher metabolism. You do that by eating protein rich, clean foods and cut on your carb intake. Exercise, lifting weights is probably the most effective exercise form to lose weight. HIIT cardio, example of a HIIT cardio would be to sprint for 1 minute and walk for 1 minute. Repeat for about 6-10 times. Taking in fat burners that are designed to supercharge your metabolism, they can help you lose fat even faster and it takes you no effort swallowing a few pills per day. – See our fat burning guide here. Remember that it can take a long time losing weight, especially if your metabolism isn’t working properly. Just remember to take one day at the time, if you follow these simple steps above you will soon be the newest member of the ripped guys in your local gym.